Purina® Rabbit Chow™ Professional Natural AdvantEdge™ is a completely balanced food specially formulated to produce shiny fur, rapid growth and excellent reproduction. This nutrient dense formula is our highest protein and highest energy food, making it the perfect choice for those who desire accelerated breeding and/or lustrous fur growth, all while feeding less per day. 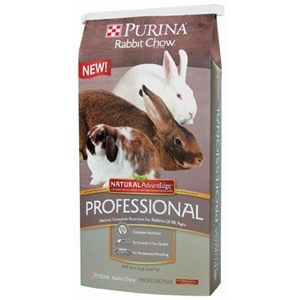 Purina® Rabbit Chow™ Professional Natural AdvantEdge™ rabbit food delivers consistent, superior quality nutrition that helps keep your rabbit looking great. That's because no other rabbit food company spends the time and effort researching like Purina. New products or improvements to existing foods are only brought to market when they have repeatedly proven themselves in research trials to deliver what you expect.